To guarantee the quality of 3D printed final products, manufacturers must ensure the purity and consistency of the powders used in production. Regardless of the additive manufacturing technology used, as the industry advances, consideration of up- and down-stream processes for powder management are becoming more of a focus. This ensures key factors are addressed such as product wastage, operator safety, powder conditioning and traceability. As well as qualifying incoming materials, a key part of the powder management process is the reclaim of additive powders after a build is complete. Once reclaimed, powders are blended and requalified. However, the great challenge is how to reclaim these powders efficiently. Without an efficient solution for this part of the process the industry cannot continue to grow. Due to the physical changes that can occur during the build process, this additive powder cannot simply be recycled and reused. The hidden deteriorated and oversize particles would compromise the quality of the next build. A powder management system is required to qualify incoming powders as well as requalify recycled am powders after a build is complete. There are several processes involved during the requalification process. The first and most critical is to remove the contaminated particles from the reclaimed powder. When considering the sectors where additive manufacturing is expected to be widely used, such as medical, automotive and aerospace, the quality and reliability of the final product cannot be compromised. In addition, due to the wide range of materials used within additive manufacturing - all with very different mechanical properties - this often leads to highly inefficient and labor-intensive processes and contributes to increased costs associated with lost good product or contamination of powders. As a result of this growing need, Russell Finex has applied over 80 years of experience in manufacturing sieving and separation solutions to develop the award-winning Russell AMPro Sieve Station™ - the first system of its kind - to ensure a key industry need is met: Guaranteeing the powder handling process is fully controllable, repeatable and with minimal operator involvement. A key to this pioneering AM powder handling system is how all functions are incorporated into a ‘one-button’ operation. A touch-screen interface - which is fully programmable for multiple settings - enables automatic processing of different powders and particle sizes. Integrating the sieving process, unique feed and flow management system and intelligent weigh system, the operator simply presses one button and can focus on other tasks such as finishing components or preparing the printer for another build. With a compact and mobile design, the system has been designed to fit seamlessly into any AM production process, compatible with powder vessel transfer or as part of a closed-loop powder recovery system. (Watch a demonstration video of this powder handling solution sieving metal AM powder). The vibrating sieve unit itself is the most advanced element, providing accurate high-capacity sieving of powders, resulting in fast process times. In addition to being easy to operate, Russell Finex has applied its extensive experience in supplying to sanitary industries to ensure all contact parts are crevice-free and finished to the highest standard, for fast and effective cleaning. This allows changeover times within 30 minutes and minimizes cross-contamination risk. This versatile unit is completely modular to address the needs of users at any stage of the AM industry, whether start-up or full-scale production. With safety and contamination prevention in mind, not only does the Russell AMPro Sieve Station™ minimize operator exposure to powders, the system is ATEX and ETL compliant. The unit can also be inert gas purged, preserving metal ETL listed machine Russell Finex powders such as aluminium or titanium and others that are susceptible to oxidation and moisture exposure. Another key requirement for this rapidly expanding global industry was the guarantee of a worldwide after-sales support network. Established in 1934, Russell Finex engineers machines for an international market and supplies to over 140 countries. With a head office in the U.K. and subsidiaries in Belgium, the U.S.A, India and China, the company has a truly global presence, enabling a comprehensive approach to customer service and after sales support. As additive production and manufacturers continue to develop and expand throughout the globe, Russell Finex has the infrastructure to support the industry anywhere in the world. 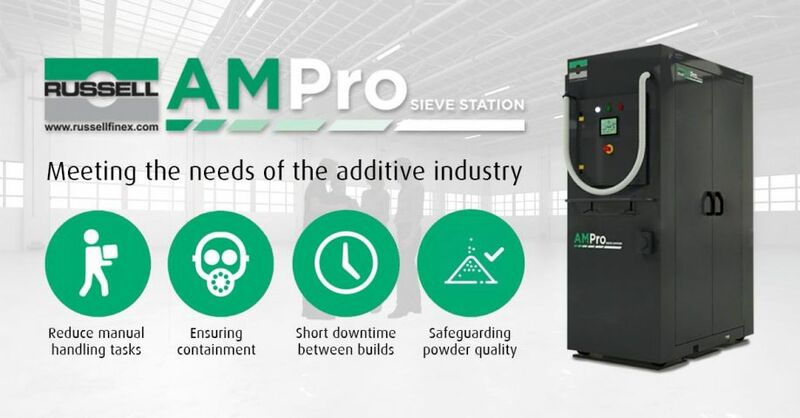 Ultimately, the Russell AMPro Sieve Station™ supports the evolution of the AM industry through guaranteeing the quality of AM powders on any scale, at any stage of the production process. It is vital that the quality of powders is safeguarded, with a system that minimizes the risk of operator involvement and has the capacity to support full scale production. Contact Russell Finex today to find out how this innovative powder handling station for the additive manufacturing industry can optimize your 3D production process. More about Russell Finex Inc.